Passive RFID (battery-less) is very popular in logistics for its low cost, however, it is subjective to too many contraints such as liquid and metal environment. Usually passive RFID system requires careful trial testing and tuning, in situations where items are more valuable that you cannot afford missing; and the items maybe not so RF friendly (liquid and metal); plus you want to have a more automated and flexible system; then an Active RFID system should be considered. 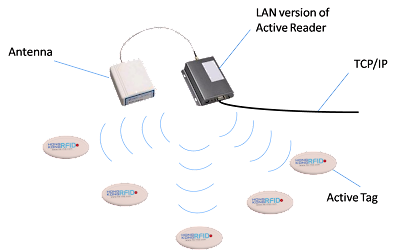 The latest Active RFID system, HKRAR-LX series, consists of a 2.4GHz reader and different types of transponders which actively transmit signals. It have excellent anti-collision ability which scans 80-100 tags per second. Without connecting to network, it can store up to 800 tags information before network is back. The HKRAR-LX series have ability of high speed identification, tracking objects which are moving at speed up to 200km/h. Even the objects are heavy metallic or liquid, the powered RFID tag can transmit the ID back to system effectively. The battery life of tag can run 5-10 years depends on RF settings and models. Comparing with typical passive RFID systems, HKRAR-LX series have high anti-jamming function in difficult environment where non-friendly RF material is present. The HKRAR-LXRX can work as a Mobile Reader or Data Collector. Now, the reader only requires a power supply from a power adaptor or a portable battery. Through IEEE 802.11b/g, the reader gathers the tag information and transmit to the wireless router, which is a common network infrastructure in many buildings. Once powered, HKRAR-LXRX is instantly connected and become part of the system. Without the troubles of the wired network installation, HKRAR-LXRX provides a larger flexibility in designing the data collector locations. In cases such as exhibitions, the booths and area are subjected to change in each events. HKRAR-LXRX can be easily relocated according to all specific situations. The HKRAT-ST1 tag is using 2.4GHz ISM standard. It provides omni-directional and unidirectional identifications. Each active tag has a LED indicator and a trigger button behind for performing searching function and alert function respectively. The HKRAT-ST1 is suitable for outdoor applications as it has IP65 of waterproof. It also applies in a wide range of temperature and vibration suituation. The HKRAT-ST1 is designed to be low cost by using specially techniques on circuit integration. This integration allows HKRAT-ST1 to perform long distance up to 100 meters. This active system usually outperforms any passive RFID systems in saving cost by reducing the number of readers and installation cost on the same coverage.